the pink toque. a craft blog: Christmas Craftin' Complete! With only a few days to spare before we head back to Indiana for Christmas, I have completed all of my Christmas gift knit projects. YAY me! Now that I don't have any time sensitive projects with a due date, I can focus finally on attempting that neck warmer for Lucas. 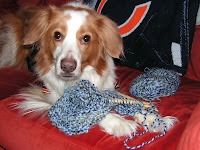 As you can see, Oliver decided to help me knit this one for "daddy." :) We have the most handsome dog on the planet, by the way. So what Christmas gifts have I finished (since the epic blanket) that I haven't shown you yet? Here's the list of recently completed works in progress... which means I can officially take them off of the WIP list. I can't wait to give these to their recipients on Christmas day! 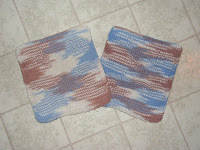 Reindeer Dishcloths. I made one of these each to give to my two grandmothers. The photo doesn't do these justice -- the reindeer is very subtle, but definitely there! (And unlike the pattern says, they really are reindeer and NOT moose!) I packaged up one cloth with a cute decorative Christmas soap (a snowman soap or a Christmas tree soap) in a tiny little holiday basket. They will make sweet little gifts. 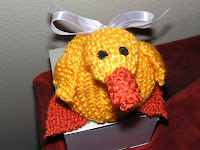 Ducky Washcloth. This one I made for my best friend, Somer. It's a similar idea to the reindeer dishcloths, but this one is made instead from a super soft satin acrylic yarn for the face instead of a 100% cotton blend. It's got a rubber duck that is fairly easy to see and less subtle than the reindeer cloths. I plan to package this up with some rubber duck soap that I got for Somer at the Calgary Festival of Crafts a few weekends ago and the knitted duck plush I designed just for her. (below.) 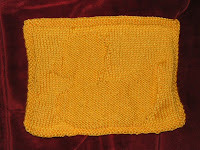 Pattern for this washcloth was found here. Baby Santa Toque. 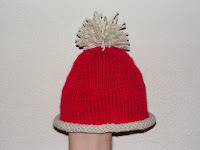 Last on my list was a baby-sized Santa toque to give to my cousin's new baby that I'll finally get to meet on Christmas Eve for the first time. This was knitted from a pattern in a great book I borrowed from the local library called Simple Knits for Cherished Babies by Erika Knight. All I did to achieve the Santa look was to start out with white yarn and switch to red for the body instead of knitting all in the same yarn. And then I added a festive white pom-pom for the finishing Christmas-y touch. I can't wait to see this one on. So that's about it! While it's very satisfying and relieving to have completed my Christmas crafting in time, I'm also feeling a little empty! There are lots of things queued up for me on Ravelry to try out, though, and I've got this neck warmer project on the go, so I'll do my best to keep busy! Perhaps I'll use my Christmas vacation time to learn crochet... ? Move over, there's something new for my plate! I think I'm going to need a bigger plate. 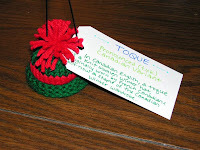 WOW.. Toque I love your stuff.. Great job I need to learn how to knit more all I know how to do is a scarf or well a toque haha and they are right plain..